The hunt is on for shipwrecks belonging to the Minoans, the ancient culture that ruled the Mediterranean over 3,000 years ago. But these downed ships don't just reveal one culture - they unlock the secrets of vast ancient economies. There's a great article over at Nature about Brendan Foley, a marine archaeologist from Woods Hole Oceanographic Institution, and his possibly quixotic search for Minoan shipwrecks. We know precious little about the Minoans other than that they were incredibly advanced for the time in terms of both art and technology - they're sometimes credited as the inspiration for Atlantis, if that gives you some idea - and we know even less about their seafaring habits. The vast cargo includes ebony, ivory, ostrich eggs, resin, spices, weapons, jewellery and textiles as well as ingots of copper, tin and glass. But what really stunned archaeologists was that the artefacts on this one vessel came from at least 11 different cultures - from a gold scarab bearing the name of the Egyptian queen Nefertiti to copper from Cyprus and tin from central Asia. The wreck provided tangible evidence of an astonishing array of contacts and trade between the different cultures of the Mediterranean and Near East in the late Bronze Age. The Ulu Burun ship sailed at around the time that Tutankhamun ruled Egypt, and "it is far more important than Tutankhamun's tomb as a contribution to our understanding of the period", according to Wachsmann. "This goes to the nitty gritty of the world. It's Wall Street in a ship." The Minoan civilization predates the Ulu Burun by a couple of centuries, so any discovery would represent, as Foley puts it, "100% new knowledge." For more, check out the original article over at Nature. 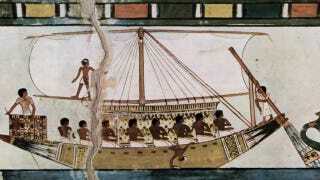 Image of ancient Egyptian boat via Wikimedia.